Angelic Warrior Joins Me to Fight Arthritis! 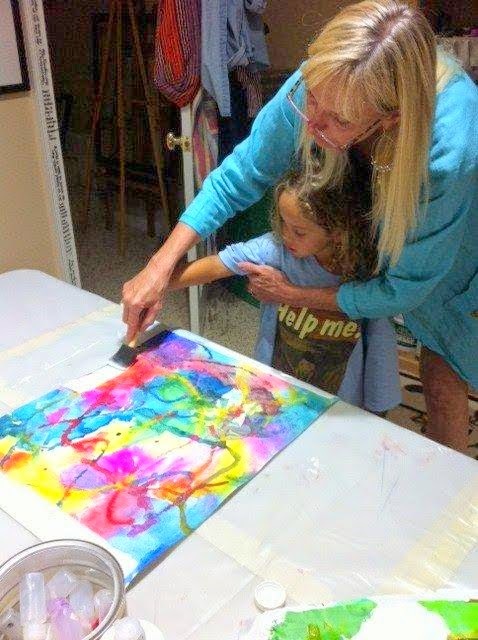 Children have a wonderful way of being open to ideas and welcoming of new experiences without expectations. Think about it…we all began that way! 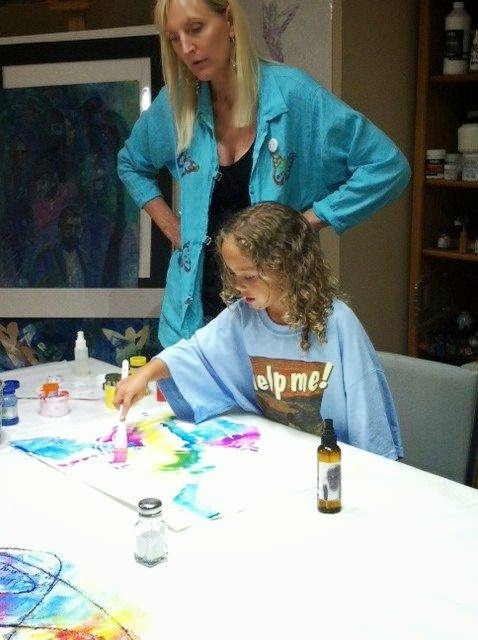 Yesterday, I was reminded of how fabulous it can be to experience painting with the heart of a child. 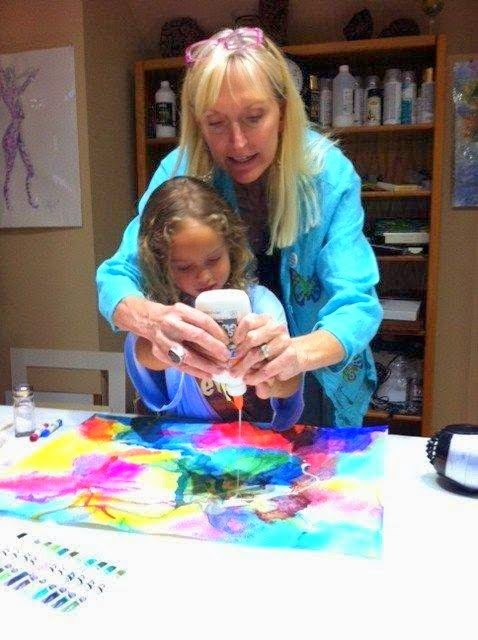 Join us for this fun watercolor art lesson. It’s great for young kids or the “young at heart”. 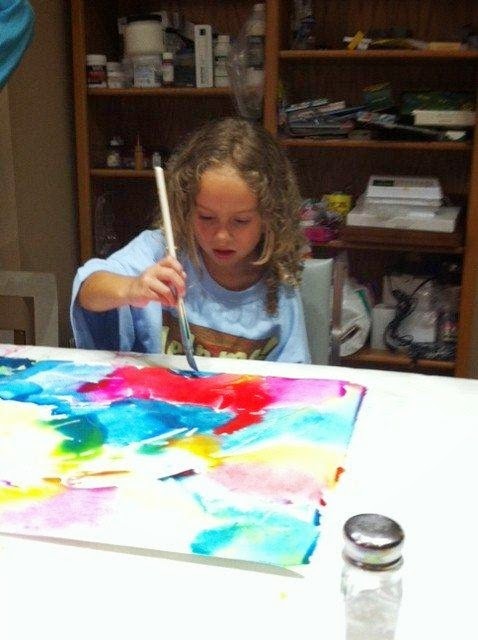 This little Art angel is a warrior! She is in a battle with arthritis. But she is not about to let that stop her! 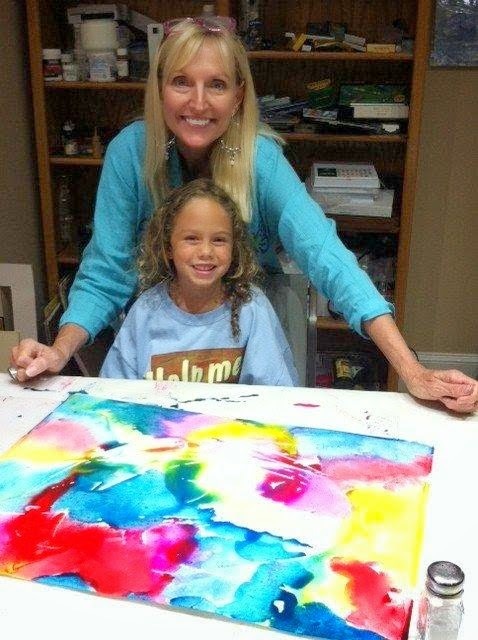 She came to my studio along with her sweet mom and brother, and we set off to CREATE something! 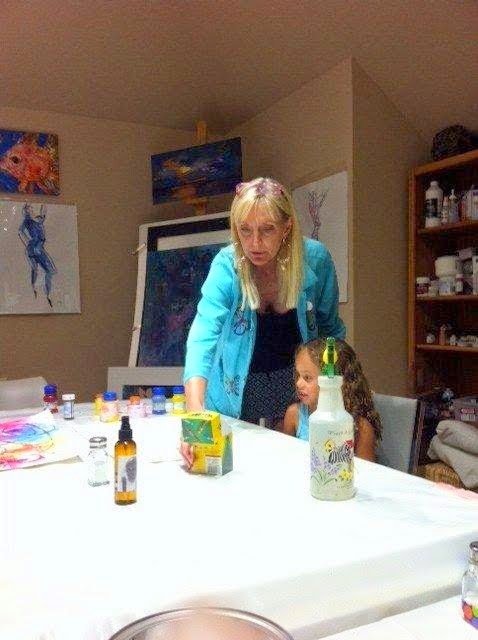 I showed her some of the materials and gave her lots of verbal instruction. Given her age, I approached it as a color exercise. 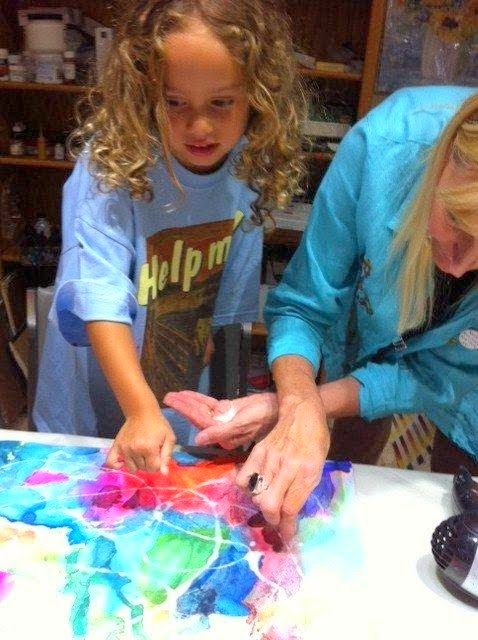 Our First Step: Crayon lines as “wax-resist”… we made random lines and got loosened up with some mark making on the page. 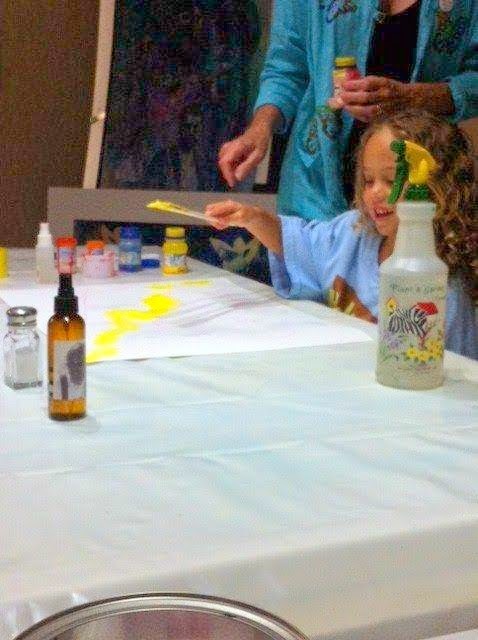 Then I had her use large hake brushes and with a pure lemon yellow color, she created a winding path of yellow on a wet piece of watercolor paper. You can’t see the crayon lines, but they added some “resist” to the watercolor, creating white or relatively light lines. Next comes blue and then comes pink! Along the way, I had her note what colors resulted when blue merged with yellow (green). Then we added some pretty Opera Pink, but the stipulation was…add it next to any color except “Green”. When she added the pink, we noted what color resulted when it merged with Blue (purple) and when it merged with yellow (orange). She and her brother had big fun naming the colors and figuring out where she could put them. We continued to add strong mixes of watercolor, all the while placing colors next to one another rather than mixing them together. Instead, we sprayed with water to encourage their mixing. We continued our guessing game about what color would result from our additions. We added Winsor Red, and avoided placing it next to “Greens”. We added American Journey’s Arctic Ice, but avoided placing it next to “Orange”. Then one at a time, with instructions of what colors to avoid, we added more pink, blue and yellow. (Avoiding the complementary colors helps to keep the colors bright.) 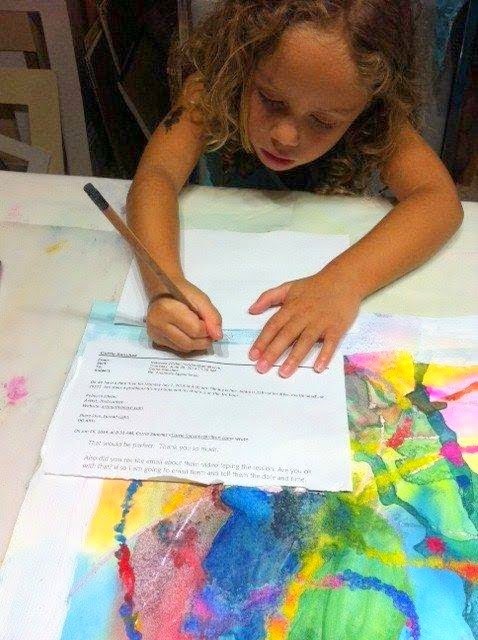 As she did her additions, a variety of beautiful colors emerged on the paper. Once the page was full of color, we added some salt for texture in places where the paper was not as “shiny”. At least for a while, we were able to restrain the application of salt to the dry areas…then it was so much fun pouring salt, that things got a bit salty! But that’s ok, we have to let go and have some fun along the way, right?! 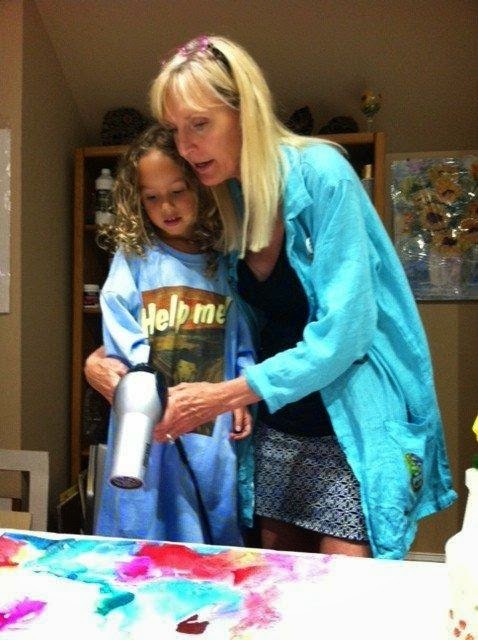 Painting with the blow dryer! After everything was dry, we ended up with a beautiful bright page full of color and texture. 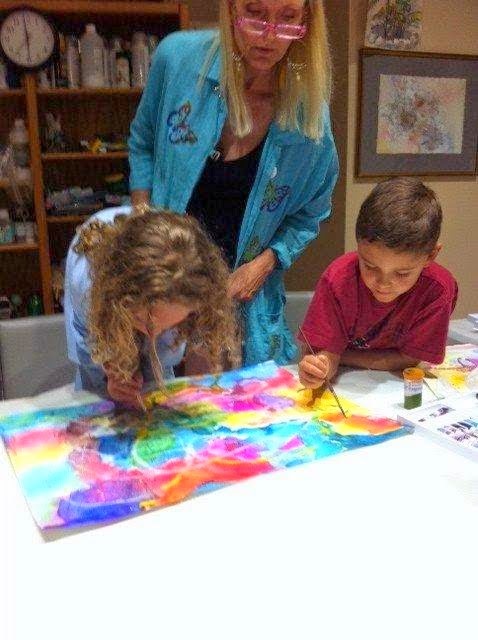 Next came the lines….To add the lines, we made big sweeping gestures with Elmers Glue. Once the lines travelled around the paper, we added more salt…(oh yesssssss!) but we did so by pinching a bit between our fingers and dropping it directly into the wet glue lines. Here we are doing this step. (Since Arianna’s arms were a bit short for our big painting, I gave her a had with the glue) We all helped put salt into the wet glue. Once the glue lines were salted, we set about adding the same colors next to one another along the lines. This requires a gentle touch. Simply touching the glue lines with a loaded soft brush full of paint works best. There were so many lines that Big Brother, Christian needed to lend a hand! Beautiful colored lines begin to form all over the page…so much fun! Then it was time to get out the blow-dryer again…watch out mom! Once she had a page full of beautiful colors and lines, I thought giving her composition a calm border might be nice. So together, we added a white acrylic border along the edge. Finally, the painting needed her signature. She looked at the piece from all directions and decided which way it should hang. I suggested a place for her to sign it and she used 2 pieces of paper as a guide for placement, and for how large to write her signature. I had her use graphite, to make it easy to write her name. She did it perfectly! September 6 D’Vine Affair Masquerade Gala Benefitting the Arthritis Foundation. at Memminger Auditorium Theme: Masquerade–Faces of Arthritis, 7 pm. 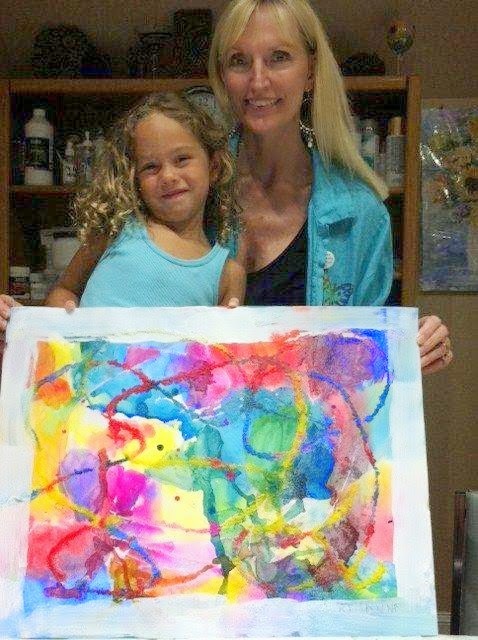 Rebecca thank you so much for doanting your time and helping my little warrior create this beautiful masterpiece. She was so comfortable with you and you made her realize that even with Juvenille Rheumathoid Arthritis there are no limitations as to what she can do as long as she sets her mind to it. Thank you again! What a wonderful lesson in the art of giving! Thanks for sharing this. 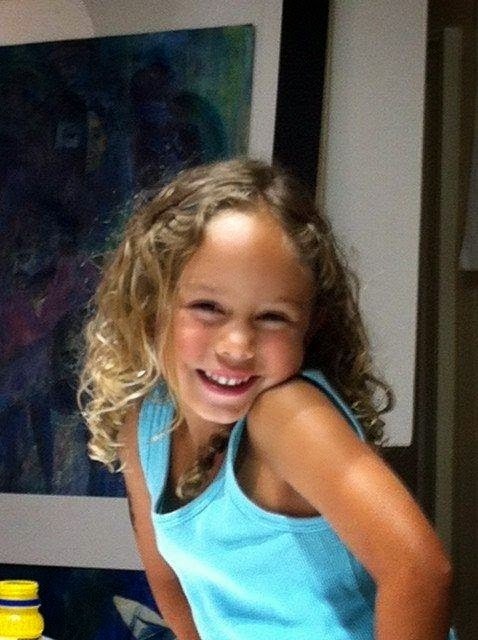 More hugs to Arianna! Beautiful and a definite masterpiece, Art Angel! Very cool, Rebecca! Donating your time to do this is really special. It looks like she had a lot fun!! !